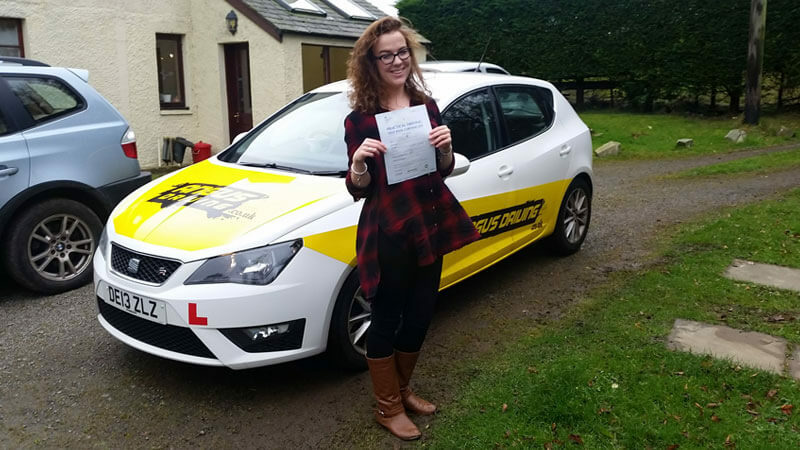 Maddie got in touch with me about learning to drive at the end of sixth year, living in Callands near West Linton the freedom that being able to drive was going bring was going to be life changing, so Maddie was very enthusiastic about getting on the road soon. During our first driving lesson we drove through to Peebles and back which was a great start. As driving lesson progressed we drove through to Peebles a few times then ventured towards Penicuik and Roslin looking for features that Peebles didn’t have to offer such as bigger roundabouts, crossroads operated by traffic lights and any other features we could find. Maddie was doing really well and constantly improving from one driving lesson to the next. Together we decided to choose Edinburgh to sit the driving test in as the driving test waiting list times are usually considerably lower than than Peebles and I feel that you learn a lot more in Edinburgh as it has a lot of scenarios and features to deal with. Maddie agreed so we traveled into Edinburgh next, looking at things like the city bypass which not before long Maddie was very consistent with. As the summer came to an end it was time to line up a driving test and work towards it. Maddie managed to get a driving test date for November which suited her, so we ran through everything to make sure Maddie was fully prepared for the big day! When the driving test day rolled in I collected Maddie early in the morning, after spending some time stuck in morning traffic we arrived into Edinburgh, carrying out a quick warm up the it was not long until the driving test was to begin, so we parked up and the rest was up to Maddie. Maddie had no problem at all passing her driving test and with her own car sitting at home this gives her so much freedom to enjoy. Well done!